Doctor Who fans in the UK have an exciting treat heading their way, in the form of The Doctor Who Experience, a huge exhibition set at London’s Olympia 2. The event is said to be an interactive journey through the history of Doctor Who, both as a look at the evolution of the television show since 1963, and also an in-universe look at the history of the Doctor and his TARDIS. But it’s the interactive part of the experience that sounds intriguing. Basically, for about 90 minutes of the exhibition, you are one of the Doctor’s companions following a scripted adventure that also features the visual effects and the creatures, and you even get to go inside the TARDIS. Matt Smith, the eleventh incarnation of the Doctor, has filmed special scenes for this part of the Doctor Who Experience. On the exhibition side of things, all of the original Doctor costumes will be on display, Tom Baker‘s TARDIS police box will be there, and there will be two additional TARDIS interior sets from the eras of Peter Davison (the fifth Doctor) and David Tennant (the tenth doctor). Essentially, this side of the exhibition is a look at the history of Doctor Who since 1963. At the moment, there’s no news as to whether we might see a form of The Doctor Who Experience tour the United States, but UK fans can book their tickets for the events right now. 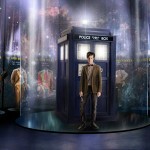 The Doctor Who Experience opens in February 2011.